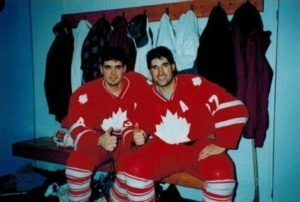 Few 15-years old players have had the chance to represent Canada in a Deaf Ice Hockey tournament in Soviet Union — a country that was experiencing political and economic difficulties before becoming Russia as it is today. Charles Fecteau is among those hockey players, and keeps unforgettable memories of the International Friendship Tournament that involved three countries: Canada, the Soviet Union and Czech Republic. “It was the first time that I played on an Olympic sized rink and it is a lot bigger,” said Fecteau. Fecteau who played defence and wore #4 during his whole career was accompanied by his father in Soviet Union. “At that time, it wasn’t allowed to let a 15-years old travel alone even with a team”. Fecteau remembers the important presence of the army and how he was marked by the poor living conditions of Deaf people. “There were Deaf people who came to see us and asked us to give them our clothes that. I almost gave away all of my clothes at the end of the trip,” said Fecteau. 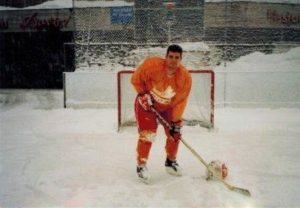 Despite the living conditions in Soviet Union, Fecteau loved the experience of his first participation in an international tournament, and it wasn’t going to be his last. The Cap-Rouge, Que. native started playing hockey with hearing people when he was four years old, but he wouldn’t be introduced to Deaf hockey until he was 10. Fecteau took part in his first Deaf hockey training camp in 1983 hosted by the Canadian Deaf Ice Hockey Federation. A few years later, Fecteau ended his career with La Beauce team in the Quebec Junior AAA Hockey League, and concentrated on playing with the Deaf. At the Deaflympics in Davos, Switzerland. 1999. The opportunity to represent Canada was made available again in 1991. This time, it was on Canadian soil at the Winter Deaflympics in Banff, Alta. “The Deaflympics are different, because there are several sports and more athletes,” said Fecteau. The Men’s team began an important period of its history in Banff, as it became one of the best nations in Deaf hockey. “We haven’t stopped to improve after Banff. We won the bronze medal at home,” said Fecteau. Fecteau was a member of the National Team at the 1995 Deaflympics in Ylläs, Finland where he won silver as well as in 1999 in Davos, Switzerland where he finally brought home the Gold medal. With an Engineering degree from the École de technologie supérieure de Montreal. Fecteau worked in the IT Services Department at the McGill University Health Centre while playing hockey. When the time came to qualify for the 2007 Deaflympics in Salt Lake City, É.-U. Fecteau had just become a father. “I wanted to go, but the timing wasn’t great with the birth of my first child, and that’s fine. It’s life,” he said. He introduced his three children to hockey, but never forced them in playing. “I think it is important to let kids decide what they want to do,” said Fecteau. He advises Deaf young players to play for fun and themselves before anything else. Fecteau still plays Deaf hockey for fun once a week.